Amber Rose Kelly was born on October 23,1986 in Hollywood, CA. Formerly, an award nominated child actress, Amber Rose wrote her first song at age 11. At 13, she recieved an acoustic guitar from her grandfather for Christmas, which she taught herself how to play. By age 15, she'd already written 7 songs, before she'd even learned a cover tune. So, she made up a 5 song home made demo called, Sorrows and Tears, which is a moody, jazzy tune, sung by the young 15 year old. She printed several hundreds of CD’s, which disappeared as quickly as they were burned. 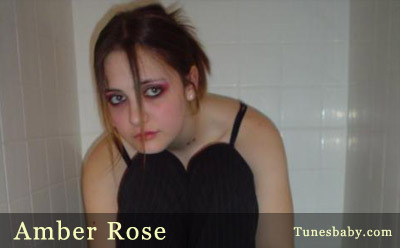 Amber Rose started playing out as a solo acoustic artist at age 16, when recording artist, Jaime Paxton, booked her to play at The Rainbow Room on the Sunset Strip. Known for her angst ridden lyrics, strong alto, and her slamming acoustic guitar delivery, she took her song, Don't Let Me Go, to #1 on the Soundclick.com Acoustic Vocals Charts after only 7 days online, and it remained there for 5 months straight. Amber Rose took a brief sabbatical from music at age 18, and then began playing out as a solo artist, again, this past April 2006, when Ian booked her at The Cat Club on the Sunset Strip. She followed this up by playing at The Rockstars Show After-Party at the swanky private club, Otis in San Francisco in May, at the Start Mobile Launch to promote her 4 song ringtones chosen for the new service, which included Sorrows and Tears, Don't Let Me Go, Now I Know, and Pushing Me Away. In June, she qualified after being voted as one of LA's Top Bands to compete for a $1,000,000 Recording Contract in the Bodog Battle of the Bands... Her new band debuted at The Roxy on August 30th to a packed house. Though eliminated in the WildCard Voting phase, Bodog invited her band back for the Semi-Finals at The Key Club on November 22, 2006 when another band dropped out. She was the only female fronted band left in L.A., and held her own against 19 of Los Angeles's Best MALE fronted Bands! She may not have won Bodog, but she won the respect of her competitors, and she is sure to win yours, too! Other shows this past year have included, The Masquer's Cabaret in July, The Cat Club in October, and the band's final show this year on December 8th for the Junkiri School in Nepal, Katmandu! There is a buzz around town about this young artist ... Come and see what the fuss is all about! Watch for upcoming show dates, and great things from Amber Rose in 2007! Amber Rose's new recording of her song "Powerless" won 4 awards on Garageband.com in October 2006!